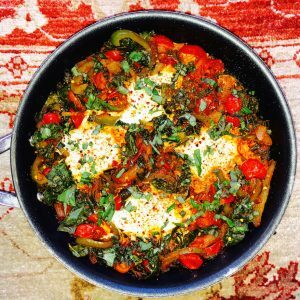 If you have never had shakshuka…you are in for a serious treat! I first discovered this dish while traveling in Morocco years ago and it has been on my ‘top 3 breakfasts list’ ever since. Rich in flavour and in colour, this can be enjoyed for breakfast, lunch or supper. Serve it up with some roasted potatoes, over a bed of quinoa or with some warm pita. Optional toppings: use cilantro or basil in place of the parsley; crumble some feta on top of the eggs; add more crushed pepper flakes…this is a very flexible recipe so you can modify and adjust it in any way that you like. In a large skillet, heat the oil over medium heat. Add the onions, garlic and bell pepper and cook, uncovered, for about 8 minutes, until softened. Add the paprika, cumin, coriander, red pepper flakes, salt, and tomatoes. Cook, uncovered, stirring occasionally, for about 10 minutes, or until the sauce is slightly thickened. Add the chopped greens and water to the sauce, and continue cooking, uncovered, stirring occasionally, until the greens are soft and wilted, for about 10 minutes. Using a spoon, make 4 wells in the sauce. Carefully crack an egg into each well and cover with a lid. Cook for 5-7 minutes, until the eggs are cooked to your liking. Sprinkle the parsley over top. Serve hot with your choice of accompaniments. Enjoy the explosion of flavours!